Happy Monday!...well, technically Monday is almost over, but oh well. We had such a laid back relaxing weekend, and it was so needed. On Saturday morning I worked my usual 3 hours of overtime, then came home and cooked a big breakfast for the boys and I.
Mason had spent all morning playing with an empty milk jug (despite his many toys), so I wanted to take him somewhere fun and different. We all got ready and went to family fun day at our local family resource centre. Mason was so uninterested in almost everything there. The main attraction for the toddler area was a giant ball pit, which made him cry every time I took him over to it. We decided to leave early and take a drive in our new car. We drove without knowing where we were planning to go, and ended up on the old highway towards Woodstock. It was a perfect fall drive along the river, with the sun shining and the colourful fall foliage. We drove about 45 minutes before we turned around and went back home. Mason slept most of the way, which gave us a chance to relax and really enjoy each other's company. At home that evening, I made us all baked chicken for supper, and we watched movies before bedtime. Sunday morning was a repeat of the day before. I did my 3 hours of OT and came home to get breakfast ready for the boys. Mason had his favourite thing ever- a whole wheat bagel with light cream cheese, and stayed in bed with his daddy while I tidied up the house. 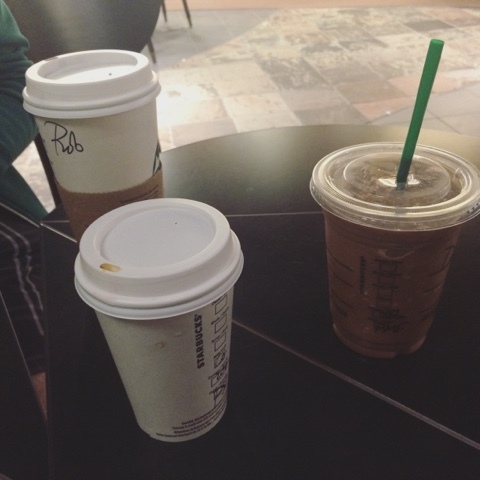 Sunday evening brought a much needed Starbucks date with my 2 best friends from college. No matter how long it's been since we'd seen each other, nothing ever changes with us, and I love that. We sat with our drinks and gossiped about the latest drama in our lives, and reminisced about the good old days when we had no cares or worries. I can't even remember what it feels like to be carefree with no stress or responsibility. Although I love my life now, we truly took those days for granted, which I was reminded of this morning when I had to get up for work.